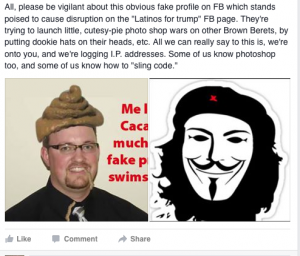 Someone has taken to task on some “Latinos for Trump 2016” to launch several fake profiles, troll numerous Chicanos, and provoke them by “photoshopping” them (very poorly) in some attempt to cause agitation/disruption, etc. Mas a menos, we know where this is coming from, but details will follow. 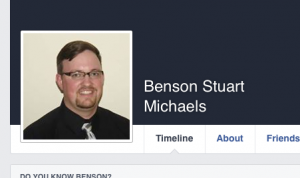 The “troll” likely even used the photo of some unwitting person, as we have seen happen recently with these fake facebook profiles being continually launched. 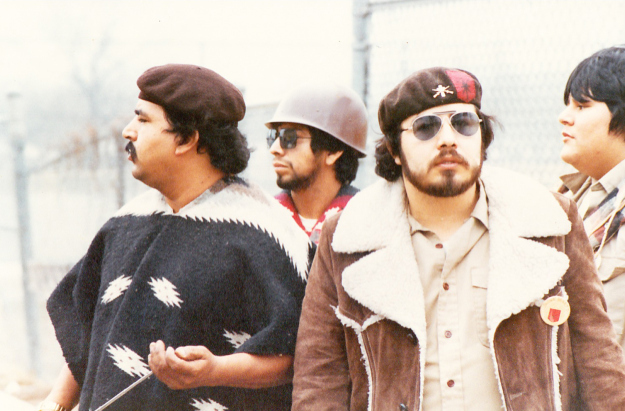 There once was a time, when Brown Berets didn’t distincly “beef” with one-another. There once was a time when the stakes were higher, in terms of the adversities and atrocities we fought. There once was a time, when the “Chisme” element never took hold, never took shape of “El Movimiento.” There was a time when such “Chisme” operators didn’t slip through the cracks. Many activist groups, of any stripe, or any cause find themselves at some juncture faced with the task of dealing with in-fighting, or worse yet, ego-slamming personalities who through their own “Chisme” personal agendas instigate and perpetuate the in-fighting. The following pictures show an historical march against Police Brutality which took place en Tejas, in the early 70’s. Nothing new there; Brown Berets have been addressing this issue for over half a century. What might seem new, which is actually really old, is how our brothers and sisters banded together once – regardless of patch, because the stakes were that high. 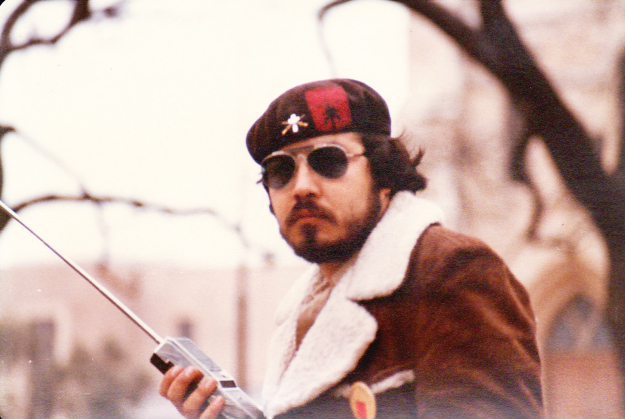 What is also depicted in the pictures are a very rare, and little known representation of the “La Causa” patch, NOT seen in yellow and brown, but red and black, with a striking semblance to the colors of the Carnalismo Brown Beret Flash. These are things that cannot be made up, nor falsified – nor can they be diluted by anyone slinging a “Chisme” motive. 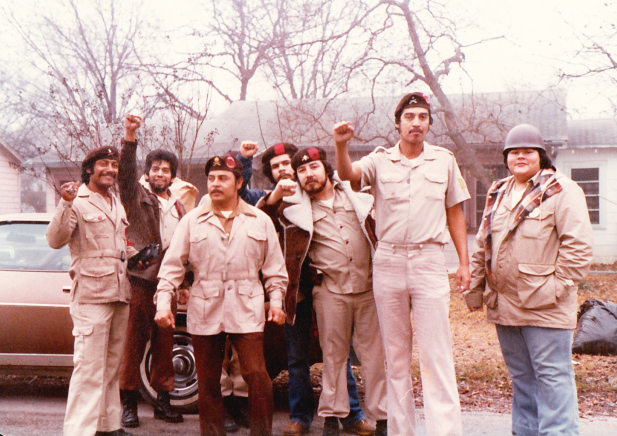 These are the things that were done during the old times, of the Brown Berets. These things are very real, the genuine article. And there are periodicals of note to back this up. Bullying culture, as it stands is bad enough. But suppression of our rights as individuals is just as bad. Such has been the case of Longfellow Middle School, in San Anto, Texas. In this instance Longfellow Middle School, and the local school district have been complacent in addressing issues of bullying. And though the school district receives money from a non-profit organization that claims to tout spreading bullying awareness, we can see how this really is just a “cash cow” steeped in subsidies. Bullying is a systemic problem, often bolstered by institutions operating from a “colonized” mindset. For our part on the particulars, Carnalismo Brown Berets are synergizing with AIM Ctrl. TX to show awareness, and to affirm ALL of our rights as people. For those who can make it, a demonstration will be taking place. Though some may NOT be able to make it, please spread the awareness as you can. We underscored it earlier, in previous posts, how the “BBNO” continually operate from a duplicitous agenda – we have been demonstrable from that regard. In many respects, we put together a digital diorama, which shows just how much to rapacity clings to ownership of the Brown Beret persona, as well as Brown Beret level activism. 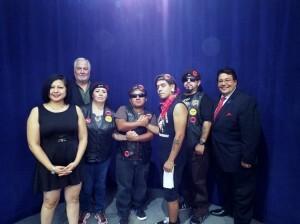 SAN ANTONIO – Sunday, March 15, 2015, Carnalismo San Anto Brown Berets and others protested a bill which allows for racial profiling in Texas – one which is similar to SB 1070, in Arizona. Republican state senator Charles Perry of Lubbock introduced SB 185. The bill would allow peace officers to ask anyone for documentation to prove their citizenship status. It would also allow the Attorney General to withhold state grand funds if municipalities forbid an officer from asking about someone’s status. State Senator Donna Campbell of New Braunfels is co-sponsoring the bill. We must put a stop to this “tongue-in-cheek” racial profiling legislation. En El Movimiento, we are riddled and rife with so many ppl hung up on their own self aggrandizement – we continually have to address this susceptibility, and permeability in order to keep things honest. There is, however a certain phenomena where distinct bad actors continually try to amass own-ness or ownership of the Brown Beret persona. There are individuals who have distinctly sought to copywrite or trademark what we do. They thirst to own it. They are so hungry to own it, they are willing to pay the fees, and take the gabacho route to have “own-ness” over a cause, in an effort to own the Brown Beret persona. LETS BE CLEAR – ANYONE MAKING CLAIMS TO THIS, VIA THE GABACHO GOVERNMENT ARE STILL THEMSELVES FEEDING THE SAME MACHINATIONS THE BROWN BERETS HAVE HISTORICALLY SOUGHT TO CHALLENGE. In other words, your legitimacy continually envelopes toward your ILL-ligitimacy, and I for one am sorry that you squandered such expense to file through the gabacho system, compromise your physical addresses in doing so, and continuing to harass other Brown Berets. We will NOT allow “bad actors” en el movimiento – it simply won’t occur.